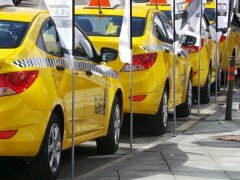 Important tips for someone who took a taxi in Moscow - how to distinguish between the official taxi from illegal, why it is more convenient to choose a taxi on the internet and why it makes no sense to trade in an official taxi. Moscow taxi is perhaps the best way to get around the city: fast, comfortably and on capital measures are not so expensive. However, to fully feeling all these benefits, it is necessary to competently approach the selection of a taxi service. In Moscow, a great number of companies offering taxi services. Many of them have their own markings - for example, use the machine only yellow, black, or pink colors, decorated with a checkered or company logo. Others are limited to using a certain brand car, while others and does no markings are not as attracted to the work of the drivers working on their own cars. Identify an official taxi on the street is almost impossible, so it is best to book by phone. However, Moscow taxi rates depend on different conditions. The most convenient way to choose a taxi over the Internet. In any search engine you will fall an avalanche of offers from which you can choose the most suitable. Among the additional services offered by the capital's taxi - providing a child Seat (this service is not everywhere), machine order with smokers or, conversely, non-smoking lounge, providing executive class car, and such pleasant things as the ability to select a radio station that will entertain you along the way. Among Moscow taxi services, there are quite exotic - for example, an Orthodox taxi or taxi ladies. Last staffed by female drivers, and its machines are painted in bright pink. Also you can find English speaking taxi. Moscow is a city with great number of foreign citizens, and it is necessary for taxi drivers to know English. Transport of animals - a separate service, which have not all taxi companies. As a rule, it costs an additional amount in the range of 200-500 rubles. However, some companies require that the owner himself has provided everything necessary for transport - cell transportation for small animals, carpet-rug for large dogs, while others are willing to provide this service for yourself for a small fee. The main problem of the Moscow taxi - optional: often, even large companies do not provide machine time or refuse the order at the last minute. You can not protect yourself and others from trouble: for example, ordering a taxi with a child seat, it is possible to get a car through smelling of tobacco. Therefore, before the trip do not be lazy browse the thematic forums on the Internet, where passengers are divided opinions about the work of a company. Moscow taxi drivers are quite choosy and can not take the order, if have to go to remote areas or to overcome the serious traffic congestion. So, preparing to leave, for example, from Biryulyovo or wade through traffic on the highway of Enthusiasts, get ready to ring round a few companies. Most taxi companies offer attractive fixed rates for trips to the airport, railway stations, as well as transit journeys, for example, from one airport to another. One of the most popular is a Moscow airport taxi which can get you to any airport and from it. If you have to move from Sheremetyevo, Vnukovo, do not rely on the taxi drivers at the airport, who shamelessly inflate prices and use the Internet, choosing a company with the most attractive rates. Special rates apply and customers met at the airport or train station; the main thing - to reserve a car in advance. In Moscow, a thriving market of "black" taxi: it is necessary to raise their hand - and certainly before you stop the car, ready to take you to the destination, and for less money than asking legitimate taxi companies. This option is not so dangerous, as like to frighten the past (at least a large part of Muscovites regularly uses the "black" taxis), but the risk to your health and wallet, of course. In addition, the majority of "black" taxi drivers - people from neighboring countries (mostly the former Soviet republics of the Caucasus and Central Asia), recently arrived in Moscow: the city they do not know, is often difficult to express themselves in Russian, and comfort them cars leaves much to be desired. Therefore, illegal taxi is better not to use it. Bargaining in the official taxi pointless: as a rule, the route is fixed, and the price determines the dispatcher. Many companies have convenient service: at the end of the route you to send an SMS with the amount owed to you.